How can I resist these colors? Why am I sitting in front of computer instead of grazing idly through the parkscapes gathering up the color? Fall beckons. Make haste to the outdoors. Hardy Ageratum and Henry's Garnet Sweetspire. I will continue the hand stitching on this piece (The grass was greener) outside, in the lingering spectacle. A potential stitch pattern? Hyacinth Bean vine takes over the back deck. So I just want to know. Do women really change their tampons at the beach or is it that these tampon applicator mini-missiles float to the top of the waste stream and are carried as if on a carpet of magic to the beaches of our lives? This guy brightened my mood. Wandering today brought me to the conclusion that either women are just plain inconsiderate or they need to lobby the tampon industry to make the applicator torpedoes biodegradable. Because after about a mile of wandering the strand of sand I counted at least 10 of them. There was some evidence of a celebration -- spent balloons on ribbons, cigarette butts and empty spirits bottles. But nothing that indicated that the celebration debris was anything but ordinary accumulation. Was the moon especially strong this week? Was there a convocation of menstrual maidens in the area? Or did Playtex, Kotex, and Tampax decide they want to be sure that their product has long life and happiness on the beach of their dreams (wait....what is it with the ex in these names anyway?). Ladies, please, if it’s you, dispose of these mini missiles appropriately. Or, maybe, just maybe, consider using something that will not live on into the next century. Natural is as natural does so to speak. And shame on the tampon industry, creating a product that does not disappear. Use it one time and discard right? And make sure it is plastic so it floats. Yeah...that's it! On a more pleasant note. I found these today. New folks to join my collection of rocks with faces. Man I love these guys! I want to do an installation of them in the future. They just speak to me. Check out that guy in the upper left corner. Sculpture! right? And here is the piece I have been working on with their cousins. I took it to the beach for a little dunk in the lake and some sun today. As a child my family would travel to lower Lake Michigan for summer holidays. I still remember that slightly moldering smell of my great aunt’s cabins, moss hanging off the roof and long stairways down to some of the most brilliant beaches of my life. Part of the journey to those cabins was watching with fascination and horror as we passed the steel mills and industrial smokestacks in and around Gary, Indiana. There was a smell of sulfur in the air and a certain dread of having to stop there while traveling through. The landscape was muscular, apocalyptic and wholly man-made. 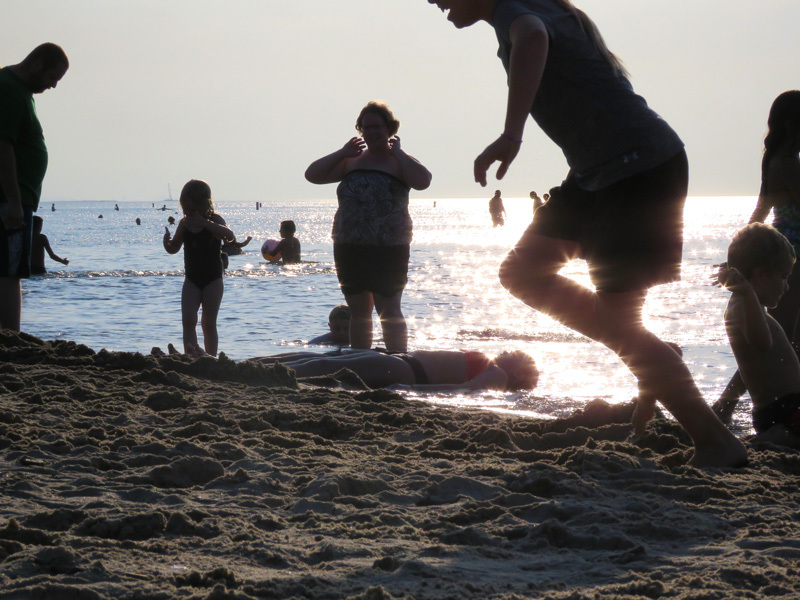 Lake Michigan beaches are crowded with families this weekend. The Indiana Dunes National Lakeshore hugs this coast and nestles in with the muscle-bound industry here at the base of the lake. Botanists, politicians, scientists and neighbors all fought for the unique ecosystems represented here. Bogs and wetlands, black oak forests carpeted with ferns, rivers, ponds and of course, the dunes. Mountains of dunes. Dunes that swallow trees, dunes that shelter wildlife, dunes that build and move relentlessly with the action of the wind. Dunes that actually created beaches for the people in Chicago. I will come to know this area better by spending these two weeks in residency. The National Lakeshore is a string of pearls, preserved and collected piece by piece into an assemblage of unique ecosystems. Though I am still stiff with judgment of how the land has been treated in the past, I see some reluctance on the part of the park rangers to condemn the industry in their midst. I am hopeful that the scientists are paying attention and that the politicians are working hard to save even more of the natural landscape. Can industry honor the earth and provide jobs at the same time? How does nature adapt to intrusion? The employees of this national lakeshore are here to witness and maintain the sweet origins of the landscape. They educate the public, observe the changing landscapes, and continue the work of the people before them who recognized the richness and diversity of this unique ecosystem. Our bees left us this week. We tried to keep them by cutting this branch off into a new hive. And they seemed to be happy. For a couple of days. Then, sometime yesterday or the night before, they left. For cooler pastures? Because of the moon? With a song in their hearts? We missed the migration, the drama of leaving a fully stocked home. And wonder about the motives and catalyst. Queens have a will of their own and a duty to build and thrive in their queendom. A sad day for us nonetheless. They left a hive of spoiled honey—larvae looking for their keepers. The heat makes the air warm with honey drafts. Our yard is bursting with azaleas, irises, bluebells, salvia, hostas, lilies and mint. But we don't have any peonies. So I slipped over to the neighbors yard and snipped a couple of buds from their prolific bush. Don't tell anyone. Hard to imagine how this species decided to put so many stamens in one pocket. Looks like a party going on.